Our very best traditional homemade Loukoumades recipe (Greek donuts) for you to recreate these little bites of heaven from scratch! Loukoumades are little bite-sized fluffy sweet honey puffs (the Greek version of donuts), which are deep fried to golden and crispy perfection. 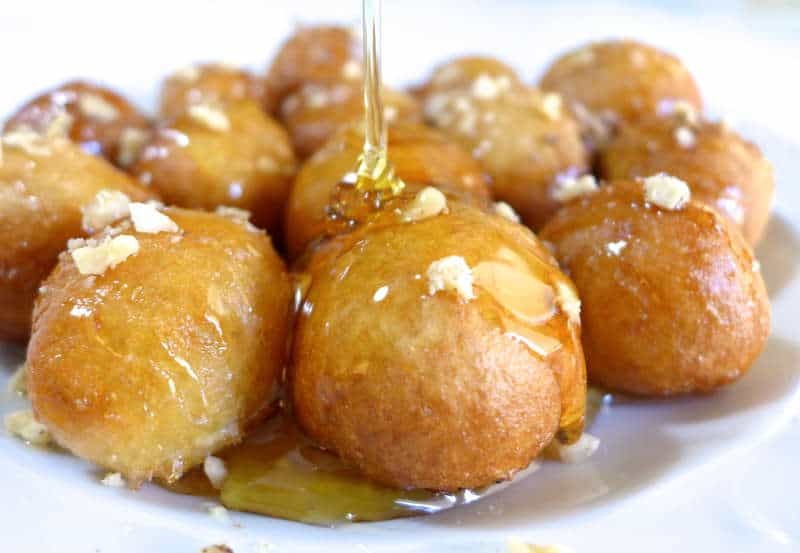 Greek donuts (loukoumades) are traditionally served soaked in hot honey syrup, sprinkled with cinnamon and garnished with chopped walnuts or toasted sesame seeds. Simply irresistable! For the chocolate lovers (like me!) go over the top and drizzle these delicious Greek donuts (loukoumades) with some rich chocolate sauce! The perfect traditional loukoumades (Greek donuts) are crispy and golden on the outside and fluffy and airy in the inside. To achieve the perfect texture for your loukoumades give the dough time to rise and it will reward you with its distinctive air-y fluffiness. When preparing this loukoumades recipe, the key is to use the right temperature. Always dissolve the yeast in lukewarm water and let the dough to rise in warm environment. If the room temperature is low, a little trick is to preheat the oven to 40-50 C, turn it off and place the dough in the warm oven. Deep fry the loukoumades in hot oil. Make sure to fry them in batches, so that the surface off the pan is comfortably filled, otherwise the loukoumades will probably stick together and the temperature of the oil will decrease. You don’t want your loukoumades to become mushy and less crunchy on the outside. So go ahead spoil yourself! Give this traditional Greek loukoumades recipe a try and enjoy with a full spoon of vanilla ice cream on top! (For a dairy free version of the traditional loukoumades recipe click here >>). Oh and you can always read this delicious recipe in Greek here Συνταγή Παραδοσιακοί λουκουμάδες με μέλι και καρύδι. To prepare this traditional loukoumades recipe, start by making the dough. In the mixers bowl add the water and yeast. Stir with a fork and wait for 5 minutes, until the yeast dissolves completely. Into the same bowl, add the rest of the ingredients for the dough and whisk at high speed (for about 2 minutes) until the mixture becomes a smooth batter. Cover the bowl with some plastic wrap and let the dough rest in a warm place for at least 1 hour to rise. Into a medium sized frying pan pour enough vegetable oil to deep fry the loukoumades. Heat the oil to high heat until it begins to bubble. Test if the oil is hot enough by dipping in some of the dough for the loukoumades. If it sizzles the oil is ready. Dip a tablespoon in some water and spoon out some of the dough into the hot oil. Repeat this procedure until the surface off the pan is comfortably filled. You should dip the spoon in the water every time, so that the batter doesn’t stick on it. While the loukoumades are fried, use a slotted spoon to push them into the oil and turn them on all sides, until golden brown. Place the loukoumades on some kitchen paper to drain. Repeat with the rest of the dough. When done, place the loukoumades on a large platter, drizzle with the heated honey and sprinkle with cinnamon and chopped walnuts. 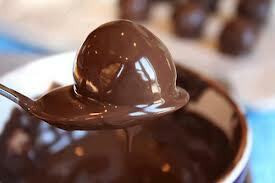 If you are in a mood for some chocolate, replace the honey with chocolate sauce. To prepare the chocolate sauce for the loukoumades, add in a saucepan the sugar and water and bring to a simmer. Simmer for 1-2 minutes, stirring continuously, until the sugar has dissolved. Add the chocolate (chopped) and whisk, until the chocolote has melted and the mixture is smooth. Pour the warm chocolate over the loukoumades, sprinkle with some roughly chopped walnuts or almonds and enjoy! I’m making a batch now. If I cook then will they be in tomorrow with or without the honey. Always Have them at the Greek Festival here in Alaska (this weekend) but they never put the recipe in their neat church cookbook!!! So this year decided to google “Greek Honey Puffs” (Loukoumades) and here your website is!!!! Thanks. I occasionally make Serbian Nut Roll, which turns out wonderful, but these are a little quicker & easier!!! Ah thank you! Hope everyone enjoyed them! Hi, you have a typo in the flour measurement. 3 1/4 cup is 26 oz NOT 16 oz. Pingback: Loukoumades – Let's Bake, Baby! These turned out great, everyone loved these.. sharing my version on my blog.